Two years in the making, the Synod of Bishops on the New Evangelization began its work this morning with a definition of what Pope Benedict's signature project is and entails. Of course, no shortage of stabs at that have been taken over the years, to varying degrees of success. The difference here, though, is that the parameters laid out by the three-week gathering's key participants won't just serve to frame the discussion that'll be taken up over the coming days by the 262 Synod fathers – the largest group since the Synod's inception in 1967. By extension, these first talks will play an outsize role in forming the context for the assembly's final message, the eventual, all-important papal document and, ultimately, the understanding by which the church's efforts to "repropose the faith" to a skeptical world will proceed and be judged. While the centerpiece of the early talks was a 6,500-word address delivered in Latin by B16's chosen facilitator, Cardinal Donald Wuerl of Washington, the pontiff opened the morning with a 21-minute reflection of his own. According to a summary of the off-the-cuff remarks released by the Holy See, Benedict defined the twin "pillars of New Evangelization" as "the confessio" – the "confession" or witness of the faith, to the point of giving one's life for it – and caritas (charity). The Pope said the former "guarantees [the] credibility" of the church, while the second, "the love that becomes ardor... is the flame that kindles others" into belief. 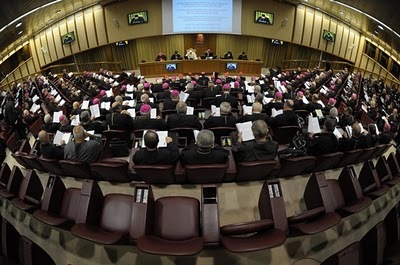 In turns by seniority, the Synod fathers began offering their own prepared statements – limited to five minutes each – in the afternoon session. The custom of a more free-form exchange in the hall (above), instituted by Benedict at his first Synod as Pope (the 2005 gathering on the Eucharist), will yet again close out each day's work; the daily discussions usually wrap up around 7pm. 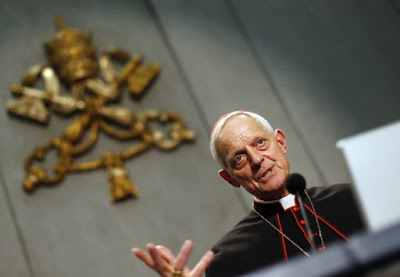 Meanwhile, here below is a full English translation of Wuerl's morning address, known in Latin as the Relatio ante disceptationem – the "report before the discussion."